This site is immediately south of the South Market, and was chosen because it is close to the South Market building, is City-owned and has close available parking (the Toronto Parking Authority garage at the foot of Market Street). The temporary market structure is a one storey, pre-fabricated building with no traditional foundation. The hours of operation will be the same as the current hours for the Farmers’ Market and the Sunday Antique Market, and in the warmer months, the outdoor stalls will continue. 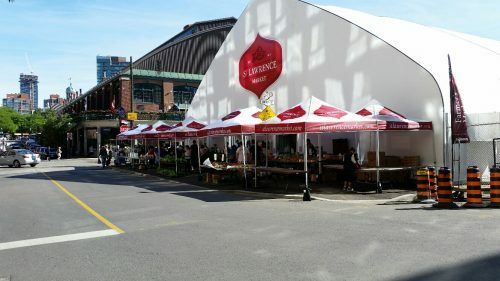 The two markets will operate for 2-3 years at this temporary location during the construction of the new North Market building. At its meeting of September 30-October 1, 2009, City Council adopted a temporary zoning by-law for the site to enable it to be used as a temporary market. If you have questions regarding the temporary market building please contact us.